Our range of products include kiwo screen printable adhesive. Sticker Adhesive(Kiwoprint D 159 AF) is a high quality, screen printable pressure sensitive adhesive for the production of self-adhesive materials for the automotive and electronic industry (e.g. touch panels, visual instrument panels, front panels, electrical devices) when high peel strength is required. High viscosity allows printing on absorbing surfaces (felt, PE foam). 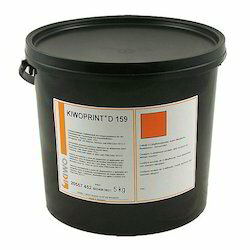 Materials bonded with Kiwoprint D 159 AF can be stored for a minimum of 1 year without any decrease of adhesive strength, if covered with a suitable silicone paper and kept dry and dark at room temperature. Looking for Screen Printing Adhesive ?